Blue Canyon is a lengthy, cliff-bound section of Moenkopi Wash in northeast Arizona, part of a branched drainage system that also includes Coal Mine Canyon, Ha Ho No Geh Canyon and Bat Canyon, all cutting into soft, multicolored, sedimentary rocks on the east edge of the Painted Desert near Moenkopi. This remote, uninhabited region spans the border between the Navajo and Hopi reservations, and has become more well known in recent years owing to the incredible array of badlands and eroded rock formations, impressive on both large and small scales; from colorful, sheer-walled ravines with convoluted walls, to tiny hoodoos and innumerable other intricate forms. Blue Canyon is good for smaller features; although quite a long drainage (15 miles), most is through rather featureless badlands containing patches of bluish clay and scattered groups of hoodoos, but without much of interest. 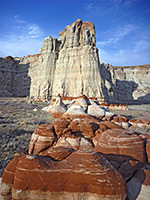 The section usually visited is at the downstream end, where the canyon is crossed by Indian Route 7; here the sandstone is red and white rather than blue, but the colors are combined in many contrasting ways, and the rocks are eroded into an amazing assortment of rounded or pointed shapes. 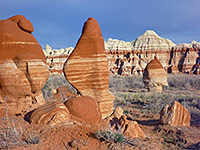 The region is similar to Goblin Valley in Utah but has the added attraction of color variation. Blue Canyon may be accessed the north starting at Red Lake Trading Post (Tonalea) on US 160, or from the south, beginning along AZ 264. Both approaches involve a drive of about 14 miles along a narrow, sandy track, often bumpy and rutted, though generally fine for regular cars except when wet. The road is maintained to a degree, unlike the majority of the side tracks, and has one main (potential) problem at the crossing of Moenkopi Wash, as this is dry much of the year but several feet deep at some times. The wash can be avoided if approaching from the north, since the Blue Canyon formations lie on the north side, but if parking on the south side, the canyon is just a half mile walk away. There are many places suitable for primitive camping in this area, and no nearby residents to consider, however, as of 2014, both a permit and an accompanying guide are required. All the canyon and its access roads are on land of the Hopi Reservation, and the tribe have in recent years become concerned at the increasing number of backcountry visitors. Guides can be arranged via the tribal government center in Kykotsmovi Village, or the Hopi Cultural Center near Shungopavi. In the north, the unsigned road starts by descending a slickrock hill behind the trading post, then flattens out and for most of the first 4 miles is either uneven or rutted or both, though the track is wide and well used, by the nearby residents. Conditions improve once the road climbs out of the valley and heads south across a treeless plateau; the surface is now smoother, the route narrower and less traveled, with long straight sections and several minor dry wash crossings. Now there is no sign of any habitation, only a few lesser tracks at intervals, but also no sign of badlands, just gently rolling, grassy or sandy plains. After 10.9 miles the track starts a two stage descent to the floor of Moenkopi Wash, initially over the plateau edge into a wide basin, where hoodoos and cliffs come suddenly into view to the east. The route crosses a tributary wash after 12.7 miles, passes a side track to the Blue Canyon formations then curves south, reaching Moenkopi Wash after 14.2 miles. The southern route, also unsignposted, crosses a landscape that is completely uninhabited, beginning along AZ 264 33.2 miles from the US 160 junction in Moenkopi, passing over three small drainages and starting the descent towards Moenkopi Wash after 12.8 miles, reaching the streambed a mile further. 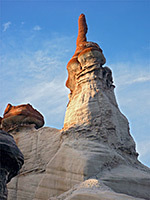 The short side track heads across bushy mud flats to the edge of the closest group of hoodoos, where it forks; the right branch follows the south edge while the other route runs along the north side towards the most extensive groups of formations. Lesser tracks split off in various directions and 4WD vehicles seemingly drive anywhere over the flat ground between the rocks. 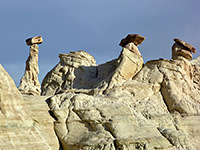 The hoodoos are centered on a flat-floored valley about half a mile wide lined by two low ridges, with formations along both sides of each ridge, while the top (northeast) edge of the valley is bordered by higher cliffs of greenish-yellow rocks, at the edge of a prominent mesa. 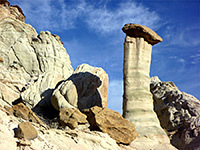 Here are found scattered, tall, graceful hoodoos; greenish pillars below brown or white cap rocks. 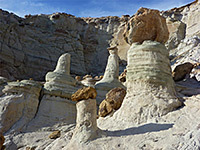 The hillside slopes quite steeply and some climbing is necessary to see the best hoodoos. The same rock layer is exposed in many other places hereabouts including on the south side of Moenkopi Wash but in this location the eroded band is steeper and hence thinner, with fewer formations. 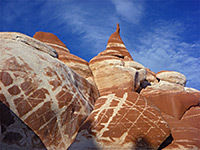 Most formations at Blue Canyon occur in the reddish rocks, at lower elevations. The red is mixed with white in many ways, from sharp, linear boundaries between solid patches of the two colors, to thin red strips and patterns in otherwise white rocks, and all combinations to the opposite; small amounts of white in deep red rocks. 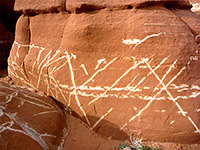 Especially striking are the delicate white markings in some of the big, rounded reddish boulders - these may be straight lines, neat circles, symmetric crosses and countless other designs, many looking man-made, such is their regularity and detail. 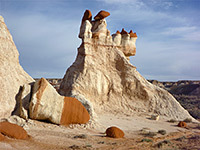 The area is also notable for the variety of erosive forms, including stout hoodoos, balanced rocks, thin spires, narrow ravines and tiny arches. Despite all this diversity, the landscape can be hard to photograph well, as on a large scale much is similar, and small compositions are generally more effective though many of the formations change greatly in appearance when viewed from different angles, and the best scenes take time to locate. Much can be viewed just by walking on the flat ground at the base of the ridges, but climbing gives an alternative perspective, however the rocks can be difficult to ascend as even the smaller boulders tend to be sheer sided and the surfaces smooth. As ever, sunset or sunrise are the optimum times to visit because the colors are richer and the shadows add an extra element to the composition. About two hours is a minimum time to see the easily reached sections but a whole day could be spent here, or more if exploring some of the surroundings.